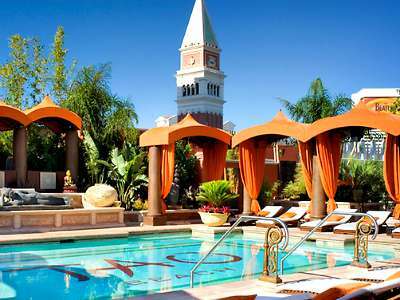 Venetian Hotel Las Vegas will get you the best of old and new world charm. Architecture and theme resorts never cease to surprise and astonish the visitor to Sin City. 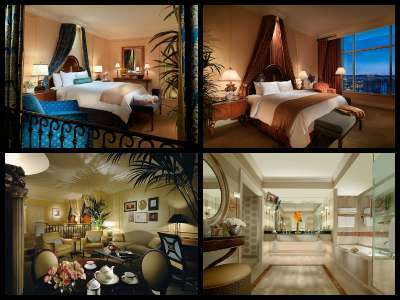 One such marvel is the Venetian Hotel Las Vegas where you get the best of everything. The Venetian has lavish settings that immediately take you to the streets of Venice, Italy; stunning arch bridges, high domed ceilings, replicas of famous landmarks, traditional gondola rides and yes even a stunning version of the Sistine Chapel. This beautifully crafted 4,000 plus all-suite resort offers an experience only rivalled by Venice itself. There are other amenities such as three distinct pools, personal concierge services, a plethora of eclectic cuisine, excellent in-house entertainment venues as well as superb shopping within the Grand Canal Shoppes area. 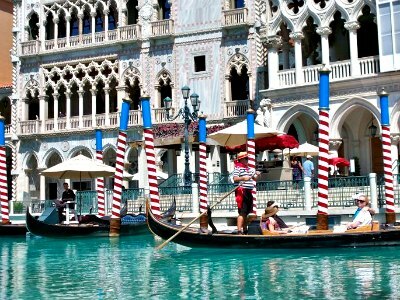 The Venetian is perfect for that European get away that is complete with a lazy gondola ride down a canal filled with lasting memories. 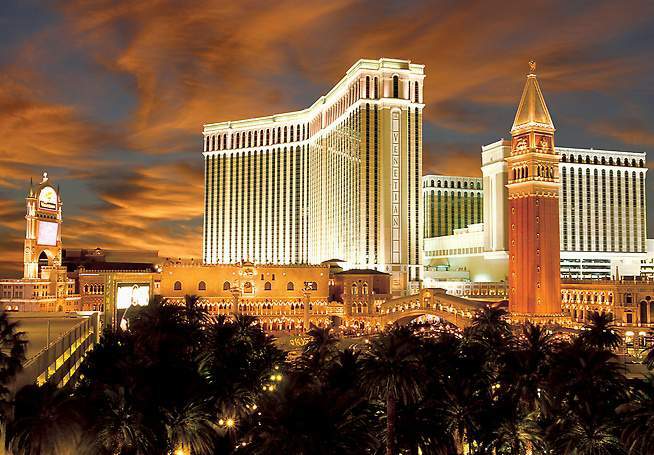 The Venetian Hotel Las Vegas has over 4,000 all-suite rooms that are situated in two different towers; the main tower and the Palazzo. The décor of these suites is plush with no expense spared during the recent renovation of both towers. The main tower houses over 3,000 suites that range in size from 650 square feet for a standard King or Double Queen sized bed to the enormous 2,900 square foot Penthouse with all of its glorious views of the Sin City. Smaller suites offer amenities such as a sunken living room, a sitting area complete with a sofa sleeper and a very large bathroom with a soaking tub. Medium sized suites such as the Rialto or the Prima are well over 1,100 square feet offering a dining area with table, a work space, sunken living room with a sofa and a fully stocked refreshment center. The Venetian Hotel Las Vegas also takes you the edge of opulence in their larger suites such as the almost 2,000 square feet Renaissance that is complete with a separate living room with a dining room that are enclosed by wonderfully crafted double doors and Italian marble everywhere as well as an extremely large bathroom. If you want to go huge, a patron can stay at one of the Penthouse suites-complete with a second bedroom and bath-that offer spectacular views, a wet bar, a sunken living room with all of the amenities for entertaining on a grand scale. Suites located in the Prestige at the Palazzo tower offer similar sized suites with upgraded amenities such as private check-in, personal concierge services, continental breakfast, and complimentary evening cocktails with appetizers as well as entrance into the Canyon Ranch SpaClub. The Sands Showroom also offers high value entertainment which includes the highly renowned show, Smokey Robinson presents Human Nature: the Motown Show and an all-female comedy line up in the Lipshtick. 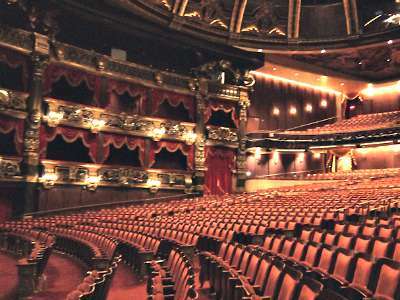 You can also find musical’s like Frank Sinatra and the ever changing Rock of Ages performance at the Palazzo Theatre. The nightlife and bar offerings do not stop at the Venetian Hotel Las Vegas with over eleven specialty themed places for you to enjoy dancing, relaxing or simply a good conversation over a glass of wine. The Double Helix Wine Bar has been voted Best Wine Bar in the past with its boutique style of relaxation; the Laguna Champagne Bar is complete with a DJ and is perfect for a reenergizing period; the Bellini Bar is the place for people watching; the Bourbon Room offers up some 50 different brands of bourbon joy; the Rockhouse is the bar for casual drinks with many different craft beers on tap and the LAVO Lounge is great to unwind at for the evening. The TAO Nightclub has an awesome atmosphere that even includes a stunning 40-foot balcony that allows for premier vies of the Sin City lights. 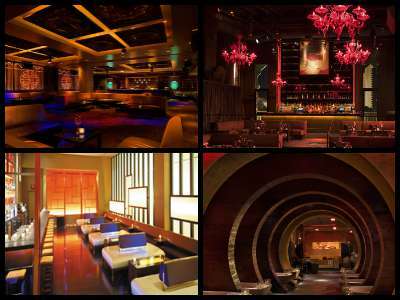 This club offers the best in techno pop, hip hop and dance music a person can find in Las Vegas. The Fusion Latin Mixology Bar brings all the fun from Mexico and the Caribbean with tasty drinks mixed with a little salsa and Latin music. 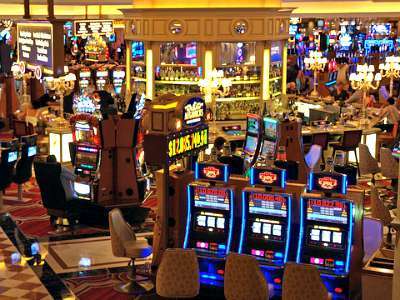 The Venetian Hotel Las Vegas has a wonderful 120,000 square feet casino to enjoy all of your gambling games from blackjack to slot machines to video poker to real poker. The casino also has an Imperial Baccarat pit that allows you to play two hands and track trends-truly the first-of-its-kind in the United States. You can also gamble at the LAVO Casino Club which offers VIP bottle service or try your hand at the race and sports book that offers viewing of 34 different sporting events on a screen that is 100 feet by 10 feet. There are numerous choices to help curb your appetite for whatever kind of cuisine or atmosphere you seek while you are staying at the Venetian Hotel Las Vegas. Over half of the 39 current restaurants are located at the Grand Cana Shoppes. This area offers everything from a food court to casual dining to upscale dining. Restaurant Rowe located within the Venetian Hotel Las Vegas also offers specialty cuisine and themed restaurants that are the creation of celebrity chefs like Mario Batali’s B&B Ristorante and the Carrnevino; Wolfgang Puck serves up eclectic cuisine at the CUT and exciting poolside food at Solaro and Riva; Emiril Lagasse has wonderful food at the Lagasse’s Stadium or a superb steak at Delmonico Steakhouse; chef Daniel Boulud brings his expert knowledge of tempting cuisine to the db Brasserie; Aquaknow is the choice for fresh seafood and the outstanding chef Thomas Keller brings French cuisine to a new level at the Bouchon. 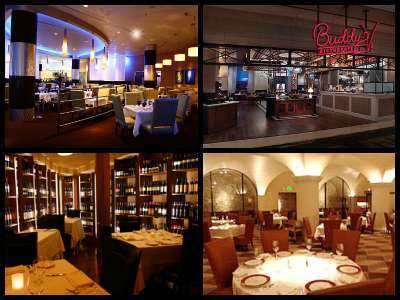 There are also several interesting restaurants located at the Grand Canal Shoppes that fit everyone’s budget. There is a food court with eateries that range from Subway to Chipotle to several pizzerias like Social Life Pizza or Pizzeria de Enzo. There is also great ethnic cuisine at TAO Asian Bistro, Tacos N’ Ritas, Casanova for Mediterranean, Sushisamba which specializes in Japanese eats with a Peruvian and Brazilian twist. You can also enjoy fine dining at Emiril Lagasse’s Table 10, Trattoria Reggiano or try the Italian seafood masterpieces at Zeffirino. You can satisfy your sweet tooth at celebrity chef Buddy Valastro’s Carlo’s Bakery or perhaps with a bit of Godiva Chocolate. There are three distinct pool areas that contain ten different pools at the Venetian Hotel Las Vegas with each pool offering its own style. High energy pools include the Mixer, Festiva and TAO Beach where the fun and sun never stop. Social and family areas are combined in pools like the Vita, Grande, Azure and Carnivale, making life a little less stressful when vacationing. If you are seeking tranquility and peace then the secluded pools like the Haven, Serenity and Venezia are the perfect place for a quiet relaxing time. All the pools are luxury at its finest with plentiful seating, cabanas and personalized service when you require to be pampered. Streetmosphere is also for people of all ages and it’s free. 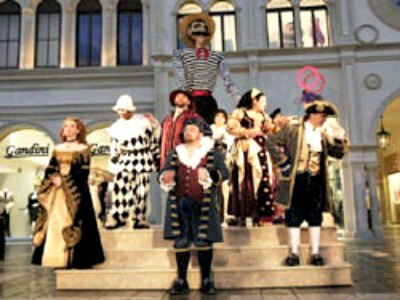 Performed in the Grand Canal Shoppes area, period dressed street performers play musical instruments, sing, dance and even offer a dramatic play at times. Streetmosphere is situated on several stages throughout the Grand Canal Shoppes in which the Minstrels of the Gallery perform energetically. The attractions at the Venetian Hotel Las Vegas are second-to-none and you can choose from a variety of activities that will keep couples and families happy. The unique gondola rides that are so popular in Venice are also popular at the Venetian. 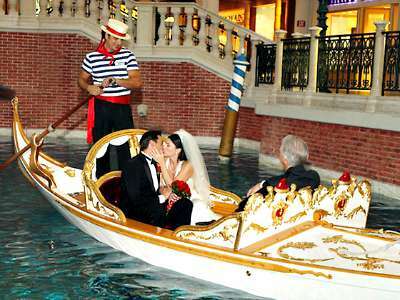 Patrons can be romantically serenaded in a variety of ways including perhaps the perfect marriage proposal or you can simply let the expert gondolier tell you a story of Italy. Gondolas are available for either inside where the climate is controlled and filled with gorgeous architecture or outside where the evening stars shine bright in the Las Vegas skies. You decide whether you want an intimate ride or one with several people. Gondola rides vary in prices and reservations are a good idea. Another stellar venue at the Venetian Hotel Las Vegas is the Madame Tussaunds Las Vegas which is a 30,000 square foot museum of lifelike sculptures of your favorite celebrities from all walks of life. View such statues of sports legends like Michael Jordan and Babe Ruth to movie icons like John Wayne and Raquel Welch to entertainers like Elvis Presley and Jennifer Lopez to even childhood stars like Shirley Temple and Mr. Rodgers. One of the more interesting things about Madame Tussaunds Las Vegas is the interactive exhibits. This attraction is perfect for snapping selfies with your favorite celebrity but watch out you might get photo bombed yourself. The museum is open daily from 10:00 A.M. until 9:00 P.M. seven days a week with admission dependent on your age. When you are looking for that once-of-a-time memory of tying the knot in a special place, the Venetian Hotel Las Vegas can satisfy even the pickiest of brides and grooms. There are wonderful indoor and outdoor packages that include the wedding gondola with your friends lining the canal, the Wedding Bridge located at the beautiful St. Mark’s Square and the Palazzo Waterfall. Your wedding planning can be made easy by the personalized wedding concierges who will ensure your special day is perfect. Canyon Ranch defines what a spa club needs to offer in order to replenish the tired soul. 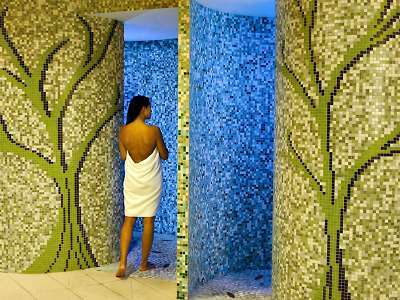 The Canyon Ranch SpaClub located at the Venetian Hotel Las Vegas has all the spa remedies one can ask for from massages to facial treatments to a nutrition bar to a 40 foot rock climbing wall. Choose your favorite or mix and match treatments for that perfect day at the spa that will leave you ready for a new adventure in Las Vegas. 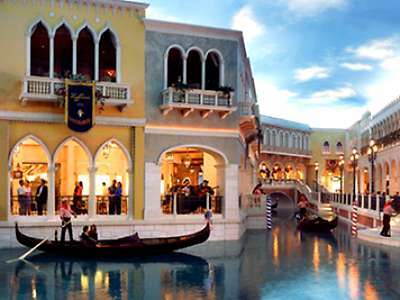 The Grand Canal Shoppes located at the Venetian Hotel Las Vegas includes some of the most unique shopping experiences a person can handle. Nestled in almost one million square feet this shopping area has stunning Italian architecture, a gondola ride on a lazy river and the famed Streetmosphere. The Grand Canal Shoppes have some of the biggest names in fashion, shoes, cosmetics and jewelry. Shops include legendary retailers such as Barneys New York, Burberry, Coach, Salvatore Ferragamo, Chapel Hats, Kate Spade, Montblanc, and Michael Kors where you will find the trendiest items. There are also specialty stores like Harley Davidson, Victoria’s Secret, Tommy Bahamas, Field of Dreams and the Island Company. If you interests lie in jewelry there is Kwiat, Mezlan, Cartier and Vacheron Constantin Watch. Whatever your shopping delights are, you will find the perfect match for your style at one of the many shops.